This season, sophomore runner Daniel Michalski broke the school record in the mile, and he and junior runner Wyatt Hartman have set conference records in the 3,000 meters and the 800 meters, respectively. Hartman and Michalski have taken two different paths to get to this point in their athletic careers, but they have become nearly inseparable on the track, during competition and in workouts. Hartman and Michalski ran nearly every race together this past winter side-byside, and their workouts are no different. When they run repeats on the track, they often alternate leading each lap and finish within one second of each other. Hartman, a mechanical engineering major, is a product of running powerhouse Maplewood High School in northeast Ohio. He’s been running since middle school and said he has known for years that he was capable of having a successful running career. Hartman was an all-state finisher 11 times in cross country and track. He said he easily could have run for a Division I school, but he chose to attend Cedarville because of the Christian atmosphere. The collegiate success didn’t come right away for Hartman, however. He struggled to adjust to the higher mileage training during his freshman cross country and indoor track campaigns. But he was able to turn it around for a successful outdoor track season. But following another sub-par cross country season as a sophomore, Hartman was forced to sit out the track season with a foot injury. This ended up being a blessing in disguise, however, as he took the opportunity to reignite his passion for running and rethink the way he trained. Unlike Hartman, Michalski has only been running for a few years. In fact, he didn’t start running until his junior year at Xenia High School. Before, he played baseball and basketball. His junior year, he picked up cross country, and then as a senior, he joined the track team. In his senior year, Michalski earned All-State honors in the 1,600 meters and broke his school’s record. Michalski, an exercise science major, found success at Cedarville in his freshman year. He struggled early in his first indoor season but broke through at the NCCAA Championships late in the season and was named an NCCAA Indoor All-American. He carried this momentum into the outdoor season, where he continued to rapidly improve in the middle distance races and found a new race in the 3,000-meter steeplechase. 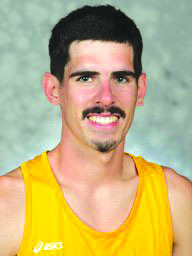 He ran the second fastest steeplechase in Cedarville history but missed qualifying for NCAA Nationals by just two-hundredths of a second. It was crushing and very humbling to miss nationals last year,” Michalski said. “But it made me realize how much I was hoping in my running as an idol. It’s made me more humble and more hungry to run faster and make sure that it doesn’t happen again. So far this year both Hartman, now healthy and enjoying his new training regimen, and Michalski, motivated by just missing nationals last year, enjoyed notable cross country seasons. Hartman lowered his 8,000-meter personal best by 30 seconds, and Michalski improved his by 57 seconds. At the end of the season, Hartman and Michalski were the top two finishers as the Cedarville men’s cross country team won its first NCCAA championship since 2010. The success continued into the indoor track season. At the Grand Valley State Big Meet in mid-February, Hartman and Michalski ran together in the elite section of the mile, both running personal records. Michalski ran it in just under four minutes and 10 seconds, breaking the school record set in 2007. The next day, Hartman and Michalski teamed up with freshman Samuel Harper and senior Forrest Thayer in the distance medley relay to break the university’s previous record by 10 seconds. The next week, in the NCCAA Indoor Championship, Michalski came within one-hundredth of a second of setting the NCCAA meet record for the mile, set by Cedarville’s Evan Thayer ’12 in 2012. One week later in the G-MAC Indoor Championship, Hartman and Michalski both took down conference records en route to win in the 800-meter and 3,000-meter races, respectively. 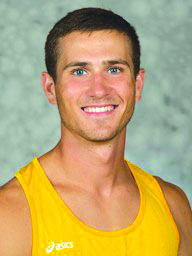 Michalski ran the third fastest time for the 3,000-meter race in school history. The two have their hopes high heading into the outdoor track season. Hartman and Michalski said they feel they have a good chance to qualify for NCAA Nationals. Michalski said he hopes he and Hartman both qualify for nationals in one particular distance. Hartman said he wants to make nationals because he’s never done it before, and he wants to set a personal record in the 800-meter race, something he hasn’t accomplished since high school. But he’s also looking toward next season. “I’m hoping that a good track season will help me transition better into cross country next year,” he said. Michalski said he enjoys the aspect of working out with a group as opposed to doing it by himself. Hartman agreed, emphasizing the importance of training with a friend. We really push each other. Dan is good at pushing even when we don’t feel like pushing,” he said. “Having someone there in workouts is helpful, too. That’s something that I haven’t had in college. A good training partner brings the best out in you, and we’ve been able to see that over the last year. No Replies to "Racing Dreams"